Trump and his religious followers deny climate change. Why? On June 1 (2017), Pres. Trump pulled the U.S. out of the international Paris Agreement On Climate Change. This is a major action that will haunt our grandchildren’s grandchildren. It also has the support of many leaders, religious as well as political, in this country. Our discussion began in Climate Shift Denialists 1, which discussed climate change denialists in business and politics. Religious denialists are possibly more important. Most of the religious people to whom I have spoken and who also deny that climate change is an issue, describe themselves as evangelical Christians. They have 2 categories for denial. First Denial: the religious leaders and TV personalities they respect say that it is a misunderstanding at best and a horrid lie at worst. Second Denial: they say that even if it starts to happen, God will take care of it, will protect the righteous. The world will survive and the blessed will be left to enjoy its beauty. Frequently, both assertions are made. But, what is an Evangelical Christian? The term encompasses people in a wide range of denominations within protestant tradition. So it probably excludes various Roman Catholic modes of the religion. But a firm definition is hard to find. Several years ago, the Atlantic magazine tried to identify the term. 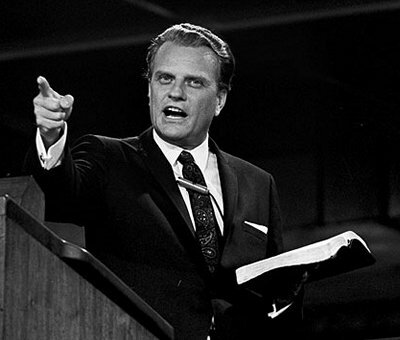 Their article started with the observation that in the 1960s someone declared that an evangelical was someone who liked televangelist Billy Graham. When Graham (Fig 4) was asked, his response was “Actually, that’s a question I’d like to ask somebody, too.” Ultimately,Graham said that evangelicals existed somewhere between extreme Christian fundamentalists and extreme Christian liberals. My interpretation – an evangelical is someone who ♦ accepts the inerrancy of the bible and truth of the New Testament over the Old Testament when conflicts occur; who ♦ accepts strict adherence to firm doctrine (which will vary from church to church); who ♦ accepts that they are obligated to spread the “good word” to the unbelieving world; and who ♦ accept that Christians are persecuted everywhere for their beliefs. Jimmy Carter (President 1976-1980) was the first U.S. politician to describe himself a “born-again evangelical Christian” and routinely taught Sunday School classes. Carter was a center-left president whose success shredded the tapestry of a unified evangelical movement. Following Carter, right-wing evangelical leaders moved to segregate their U.S. political far-right believers from the center-to-left evangelicals; these religious extremists unraveled Billy Graham’s vision. Today, most non-evangelicals think the term applies to the far-right mentality. This may not be true, but much of the religious vote for Trump was from self-identified evangelicals. New York Times printed an article (2017-0702) on Donald Trump that ended by quoting televangelist Robert Jeffress . Fig 5 presents the final comment that was deleted from the on-line link shown. First Denial: Why do evangelicals deny climate shift? And why do they make up a substantial part of Donald Trump’s support base? This is my very personal response to Christians in denial. Why Support Trump? Here are a few points hidden in the background of Donald Trump’s presidency. For Trump, Truth is whatever is currently being stated. This is the feature of our new Trumpocene age. Trump is religious if – and when –he says he so. Truth changes when stated differently. In office, Donald has averaged 2.1 lies or mis-speaks per day. He appears not to understand lawful processes. He seems to have no Theory of Mind that would let him to work with others. His nasty view of women is well known and well documented. This is important because more than half of our population is female. See the previous point. These points allow him to ignore minor things like promises, even contractual agreements. In real estate adventures he used “So sue me” to successfully underpay business debts. This rather profane profile cannot explain why Mr Trump appeals to people proclaiming strong religious fervor. My own viewpoint is based on this – Trump’s innate need to control and dominate just might appeal to other like-minded people. Evangelical = Tyrannical ? I grew up in the South, the son of a Presbyterian preacher. My small city was dominated by Southern christian churches that hosted revival meetings for their congregates and provided my first definition of born-again evangelicals. Our school required attendance at student assemblies where a preacher (maybe from one of the revivals?) harangued the student body, trying to convince us all that his was the true Truth, all those other truths were wrong. Back then I concluded: Every born-again must be some kind of totalitarian extremist who dreamed of theocratic hegemony. As the years past, this view has been reinforced by watching politicians turn dogma into Law, enforced by the police and backed up by the military. It is clear to me – encoding religious bias into law establishes tyranny, not Truth. The truly religious convince others by their witness, not by force. This politicization of religion indicates the emptiness of zealotry – what kind of truth must be supported by prisons? Such a path leads to horror. For me, over the years, evangelical remained a close kin of tyrannical. Just evangelical dogmatists. Not Christianity in general because there is a strong thread throughout it that pushes back against the totalitarian/theocratic merger of Religion and State..
Why does Trump appeal to self-appointed preachers and televangelist show-boats? Could it this be following the old adage “birds of a feather all fly together” ? No! An evangelical need not be a tyrannist. The evangelical leaders are the ones working to establish a theocracy, their congregants seem to be doing their bidding. But, over the last decade or so, I have met people who identified as evangelical and also were clear, open-minded scientists. They use rational techniques to explore the nature of the universe; they reject ideas that conflict with clear data. This is true witnessing to their faith. To them, the world itself, is the window into physical reality. Spiritual reality is a separate state of being, not explainable by chemistry, biology or physics. 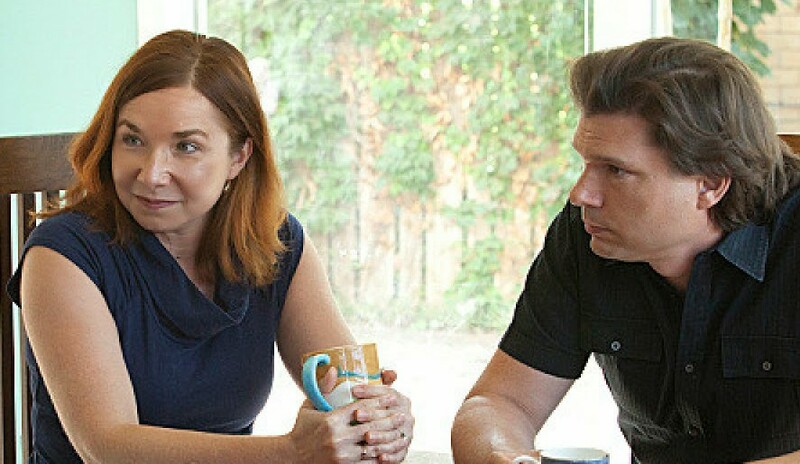 My respect for the evangelical movement grew when I discovered Katharine Hayhoe, who identifies herself as a deeply religious evangelical and is an good environmental scientist (Fig 7). This is the same person shown in Fig 2 (below). Listen/watch Katharine and her husband Andrew. See, not all evangelical preachers are self-aggrandizing tyrannists. Some are like Andrew Farley, working hard to meet the personal vision of God’s will. Now watch Katharine’s discussion on the compatibility between evangelical faith and data based science. Second denial: Will God step in and make this damaged world all better? We started this series because of a May 26 (2017) statement by Tim Walberg (Fig 8). The Fig 9 gives my personal understanding of the “God will take care of the climate problem” problem. We must conclude – We humans are responsible for everything we do. God promises that He will never again destroy us because of our evil. Let us not confuse this with its converse! This is not the promise to rescue us from the results of our own evil doings. We are given authority. If we try to destroy His precious and beautiful creation, it will happen. And this is exactly what is happening with climate change – God will not undo what we, His chosen species, have decided to do. We are free to scour the Earth of all life. 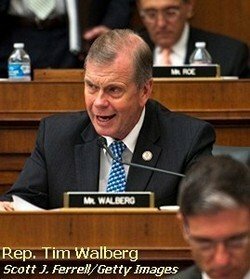 Of course, Walberg did not say God will take care of the issue, just that He can. So maybe Tim is like me – pretty sure He could; but knows that – since we won’t, He won’t. Hypothesis: But maybe Tim is like some other evangelicals I have spoken with, maybe this is his way to force God to produce the Second Coming? Added note: I recently saw one of Katherine Hayhoe’s excellent podcasts (Touching The Third Rail) where she discusses the biblical indications of man’s ability to destroy the world. She mentions the Genesis references we show in Fig 9, but also refers to this Revelation text that might mean that God will destroy those who destroy Earth. Apparently, it is not God being quoted, but “the” 24 elders who prostrate themselves in the presence of God and and seem to be instructing the Deity on what to do next. 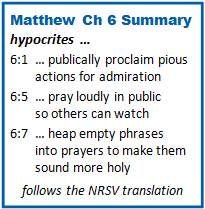 (See the quote from the Phillips bible.) Revelations always has made me itchy. It was one of the last to be accepted into to biblical canon, and I have always wondered about the all consuming politics that were responsible. Some folks go to this chapter first, though. I add it here for completeness. This is an abbreviated version of Prologue presented in in Climate Shift Denialists 1. Human-caused climate change is happening right now; it is an on-going chaos shift that, once accomplished, can never be reversed. Although real and currently happening, it is strongly disputed (in the US). Fig 1 is the world temperature graph from its Dana Nuccetelli’s (its author) YouTube presentation. 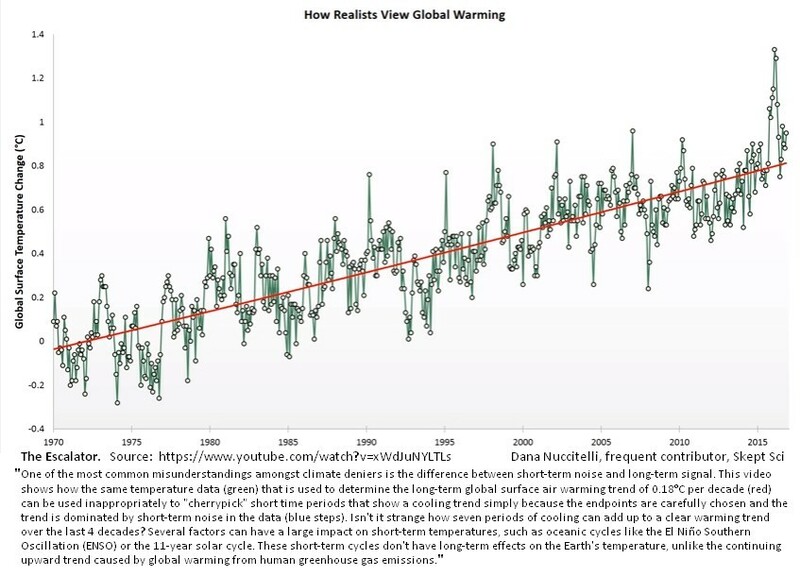 This historical data trend is a permanent feature on the Skeptical Science blog. Check their website for the 10 top alt facts used by denialists. World weather is the jagged green line. World climate is the straight red line. Climate is the long-term average of weather. 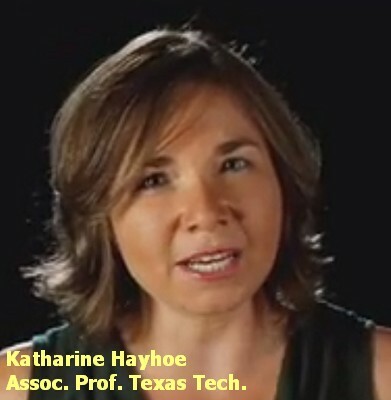 Dr. Katharine Hayhoe (Fig 2) is one of the many scientists who talk about the climate-shift problem. Watch as she discusses various climate facts, false and true to a group of interested people. Q: Why do Americans doubt climate change? A: Their leaders and TV talking heads say they must. Q: Why do people in authority deny what is happening? A: Motives of denialist religious leaders are complicated. This has been the topic of our post. Have a comment? Click on the title of this post, go to bottom, let us know. I am a physicist with years of work in fusion labs, industry labs, and teaching (physics and math). I have watched the tech scene, watched societal trends and am alarmed. My interest is to help us all improve or maintain that which we worked so hard to achieve. This entry was posted in Natural Resources, Politics, Pres Trump and tagged Billy Graham, climate change, climate change denialists, Donald Trump, Evangelical Christian, Katharine Hayhoe, Paris Agreement on Climate Change, Skeptical Science, Tim Walberg. Bookmark the permalink. As far as I know, the Evangelical Christians consider Catholics as something foreign and alien. Whereas Catholics try hard to include even the Protestants in ‘Christianity,’ it is not always reciprocal (though some denominations, such as Presbyterians and Anglicans, and possibly individual others make more of an effort to be ecumenical). It is hard, when a group advocates a non-Biblical ‘Gospel of Prosperity,’ to find in them compassion – and actual help – for those they have determined God is punishing. Anyway, that’s my take on it. God has a long history of helping individuals in their hearts – and not stopping the atrocities committed against them; we needn’t go further than the Holocaust for a sample, and there are many more, including the Inquisition. Why the Evangelicals are so smug – after Black Lung disease and other examples – that things are magically going to be fixed any time some human makes a huge mess, I don’t understand. It’s never happened, and it isn’t going to. He’s left us the capabilities – and the desires – to work on our own world; and the freedom. Thanks for your summary, Alicia, I could not agree more, This is the way it will play out – or not.. Enter your email address to follow LastTechAge and receive notifications of new posts by email. ITER-2 Machine is being built – will it work?